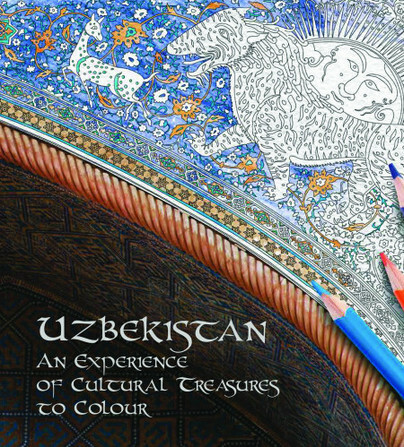 You'll be £15.99 closer to your next £10.00 credit when you purchase Uzbekistan: An Experience of Cultural Treasures to Colour. What's this? Order within the next 7 hours, 7 minutes to get your order processed the next working day! From the blue and gold splendours of Samarkand to the holy city of Bukhara, the architectural heritage of Uzbekistan is simply extraordinary. Over the 2,000 year history of the Silk Road, its fertile oases have attracted countless travellers and conquerors who have profoundly made their mark on human history, such as the conqueror Tamerlane or the scientist Ulugh Beg, who discovered the sundial. All have bequeathed an inheritance whose legacy can still be admired today. By its geographical position, Ancient Uzbekistan was created from a melting pot of different cultures. Iran, the Eastern Steppes, Siberia, India and China have all added their own influences on the local arts. Over the centuries, due in many parts to the Silk Road, these exchanges have continued to grow. Cities such as Samarkand, Bukhara, Tashkent and Khiva became famous in the Middle Ages not only for their cultural wealth, but also for science. In homage to this rich heritage, this book is a celebration of the arts and pictorial traditions of Uzbekistan. Photographs of architectural works, murals, ceramics, tapestries and ornamented textiles highlight the country's cultural treasures, accompanied by short texts explaining their historical significance. On the right-hand page, the reader is given the opportunity to colour in their own drawings based on the beautiful photographs provided. The quality of the print, the paper, the colours, the selection of contents, and the sheer beauty of the book is a joy. It is perhaps such a pretty object that I am not sure that many people will dare to colour it and risk ruining it, but I can see it inspiring many, and also making many people wonder about the country and its history. If you are looking for an unusual present for somebody who loves colouring book, or simply somebody who might appreciate a beautiful book about the arts, craft, and architecture of Uzbekistan, I’d recommend it. It’s so beautiful! And informative. As a cross-roads of cultures and civilisations, Uzbekistan has an artistic legacy that continues to this day.